June 11, 1910. Page 4, column 4. 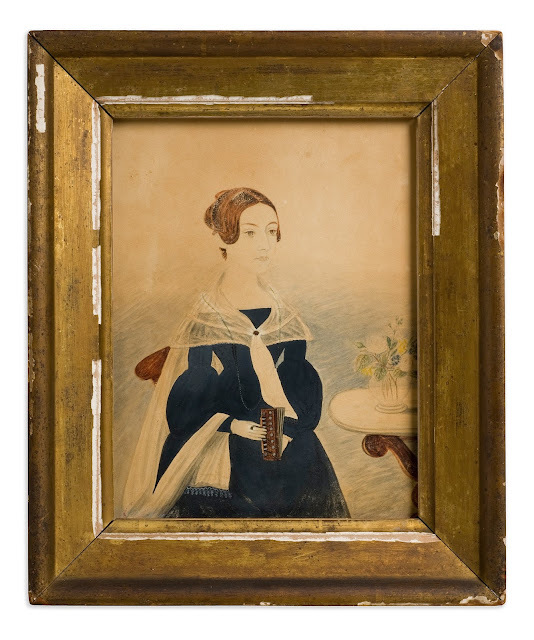 An Early Portrait of Caroline Mills Smith, circa 1850. The funeral services of Mrs. Caroline M. Mead, widow of William H. Mead, whose death took place last Friday, were held Monday afternoon, at the home of her niece, Mrs. Henry V. Peck, in Cos Cob. Rev. M. George Thompson, of Christ Church, officiated, and a quartet composed of Mrs. Lillian Rees, Mrs. Carl Martin, Arthur H. Dorland and Dr. Carl Martin sang several hymns. The granite obelisk marks the burial site of Caroline Mills Smith Mead. The grave of her father, Ebenezer Smith, is marked nearby with the flag. The internment was in the family cemetery, in Relay Place. Mrs. Mead was the sister of Benjamin Smith, for many years Town Clerk, and a prominent and influential citizen. She leaves two nieces, Mrs. Peck, above mentioned, Miss Elizabeth Smith, a nephew, Benjamin Smith, all of Cos Cob, besides a number of relatives in Stamford and elsewhere. 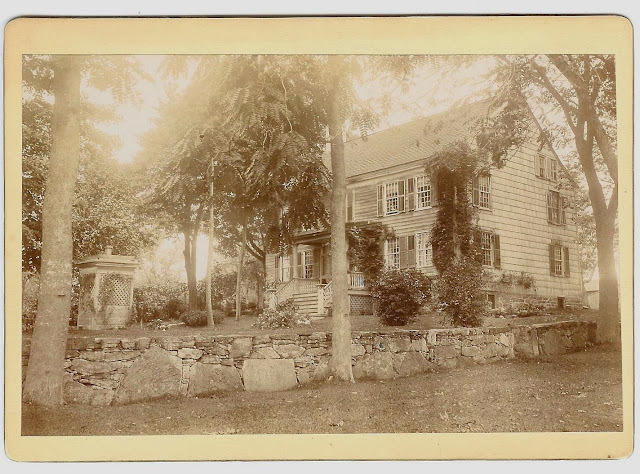 Mrs. Mead owned a large acreage of Cos Cob property, and although advanced in years was deeply interested in building up that part of the town, opening up her land into desirable building lots, handsome cottages having been built on many, Mrs. Mead's wish being that only a good class of houses be constructed, and the attractive section known as Mead Circle, which has so rapidly built up the past few years, was a part of her holdings. August 6, 1910. Page 5. See also this piece from Greenwich News the day before. The fire of last Friday afternoon, at Quaker Ridge Farm, of Miss Sarah C. Mead, the old Solomon Mead farm, consumed a section of the barn containing ten box stalls all occupied by horses, in which seven horses were also burned, it being impossible to rescue more than three, the flames involving the whole so rapidly. Six of the horses were valuable animals owned by Greenwich residents, and were there for care and attention, such as is not afforded in town, and three were saved with the greatest difficulty. There were also burned some eighteen to twenty tons of hay, and the immediate building, the other adjacent buildings being saved through the prompt attention given with water, the big tank supped by wind power being fortunately full, and the early response of the auto chemicals from Greenwich and Port Chester. The loss in great part, but not including the horses, is covered by insurance. Manager Mortensen says the fire was set by children playing with matches. Matches and fire are interdicted and this rule has been rigidly followed. But in this instance they were hauling in hay, the mows being full, with the exception of a partial load, for which they had gone to the field before cleaning up the hay that had scattered on the ground. Meantime a Greenwich peddler drove up, and some children climbing onto his wagon, got some matches, and while unobserved set fire to the hay lying about. In an instant there was a blaze, and it encompassed the entire front of the stalls. Being in the field at the opposite side, those gathering the hay were not aware of the fire until they saw the rising smoke, when they hastened to the rescue. All effort was expended to save the horses first, and the water from the tank was husbanded to this use, and that of preventing the spread to other buildings until the chemical machines came, and it was this foresight that prevented greater loss. "The management of Quaker Ridge Farm, at North Greenwich, takes this opportunity of expressing their grateful appreciation of the generous and efficient services rendered by the Greenwich and Port Chester fire departments, and friends and neighbors, who so readily responded to the call for assistance at the fire which took place on the afternoon of July 29th."